Hello polished world! I know it's an odd time for me to be posting, but I really wanted to share with you an amazing Nail Art Society kit I just received in the mail. I want to start off by saying that I have not been sharing some of the kits recently due to a really hectic schedule, but now that everything is settling down, I'm going to get better at posting the kits once they come in and share with all of you how awesome they truly are! I've been sad that I haven't been able to use the kits. 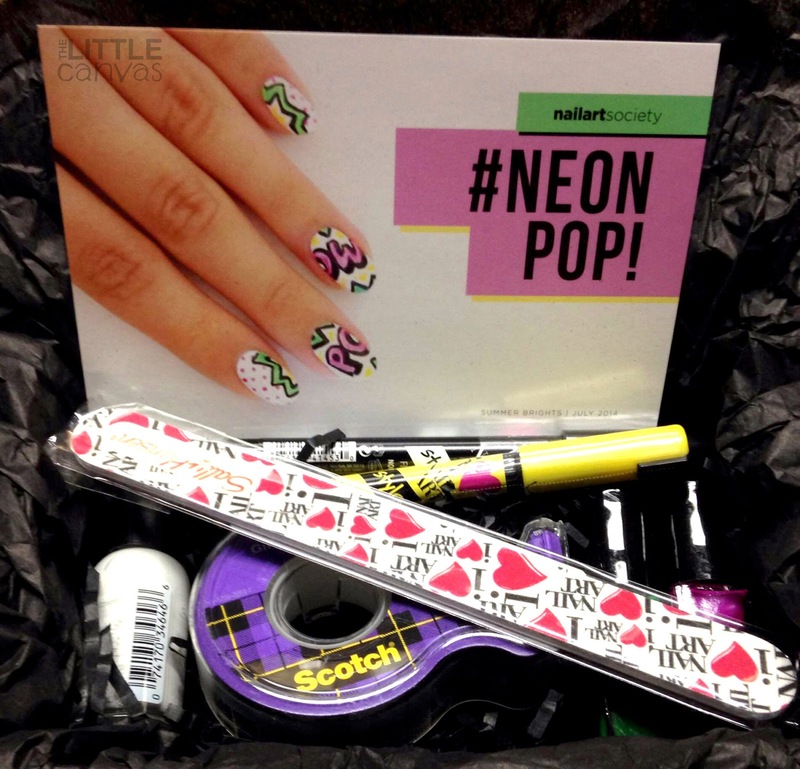 The kit I'm sharing with you today is the #NeonPop kit which contains many goodies from Sally Hansen! In my opinion, this is the perfect kit for any nail artist! First though, I want to talk about the new box that that was in my mail box! I'm so used to the normal brown box each month, so when I opened the mail box and saw the black box branded with the NAS logo on the side, I was rather excited. I think branding is super important in this day and age, and even though this is a small thing, it's a perfect marketing tool. When I opened the box, I was greeted first with the NAS card which tells you what the theme is and what the kit contains. I think this is so cute, especially with the nail art look right on the front. Then I opened the box to see all the goodies laid out perfectly! White polish, nail art pens, neon polishes, tape, a nail file! Goodness gracious so much stuff! 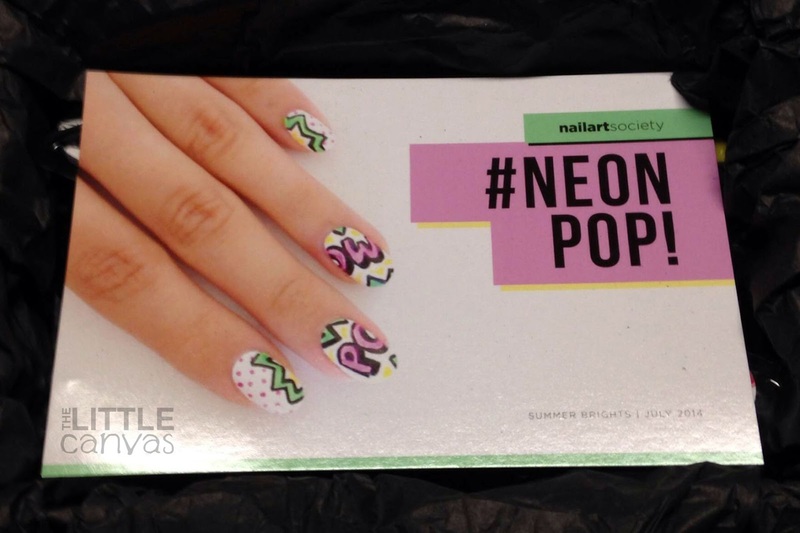 As you can see above, with this kit you receive one bottle of Sally Hansen White Out, the perfect base for a neon design! I quickly saw that the two bottles which I thought were stripers were actually neon polishes! The green is Hot Wasabi and the purple shimmer is Intense Iris. So so pretty. Then there are the two nail art pens, one in yellow and one in black. The tape is an added bonus, especially since tape manicures are all the rage. If you have a pair of chevron cutting scissors, I highly suggest getting them out and using them with this tape! I wonder where my pair is....hmmmm. I'm in love with this kit and cannot wait to play around with it! It is such a perfect kit for summer with the neon theme! What I absolutely love about this kit is how easy it is for someone to create a nail art look. Literally, the ideas are endless, even for those beginner nail artists. 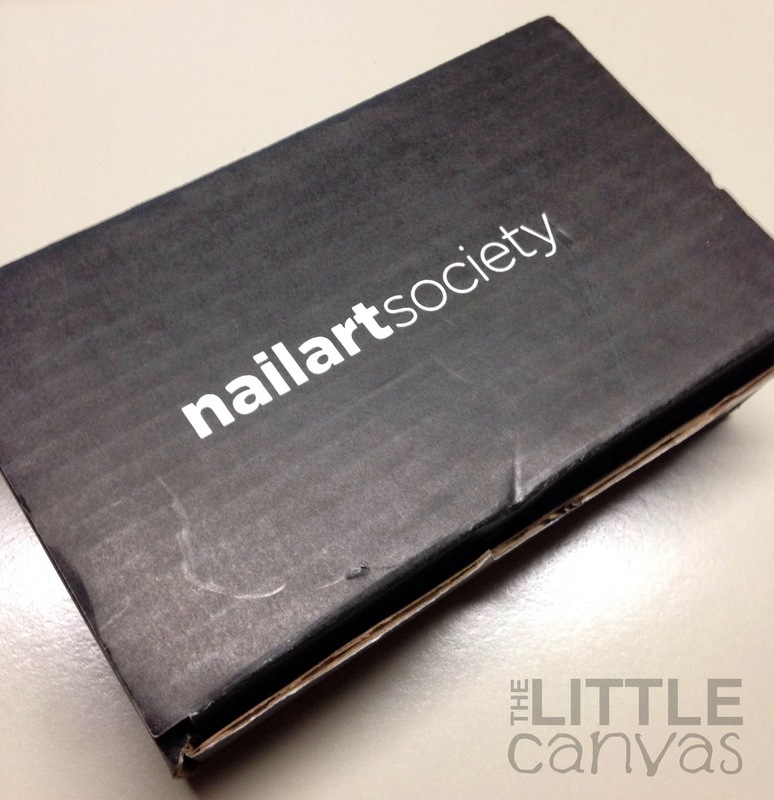 You can get your own kits by signing up for the Nail Art Society on their website. Kits are $11.95 each plus shipping. I honestly do not know if it is too late for you to receive this kit, but usually kits are sold A La Cart in their shop at a later time! Bestie Twin Nails with Fashion Footing! Take Two!